Most everyone has heard that dark chocolate is good for you thanks to all the studies and articles in prestigious medical journals. It is important to note that all chocolate is not the same, and that candy bars may actually have little to no actual cacao. XO Healthy Chocolate is a clean, cold pressed high antioxidant chocolate and is nothing like the candy you purchase at your local grocery or drug store. 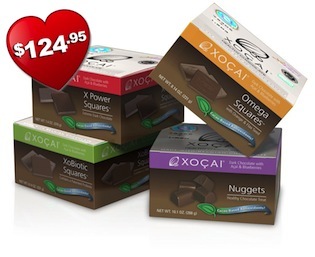 Right now is a great time to get wholesale pricing on the high antioxidant XO chocolate products. In addition to our clean cold pressed chocolate, we also have a high antioxidant chocolate meal replacement shake for weight loss that was featured on the cover of the American Journal of Bariatric Medicine. We even have the Xe Energy Drink that Bill O’Reilly of the O’Reilly Factor talked about as his Factor tip of the day. He had mentioned that he drinks Xe every day for his health. Any of these high antioxidant health products are included in the Buy 2, Get 1 Free Deal. Valid 6/25-9/1. Now is the time to stock up!!! If you have interest in a home based business, you can help others get healthy and wealthy while growing your own XO Healthy Chocolate Team! Sign up for 2 boxes, get 1 free. Sign up for 4 boxes. get 2 free. ***ASK ME HOW YOU CAN EARN $1500 YOUR FIRST WEEK! I am Lynette Henk, XO Healthy Chocolate promoter. Feel free to contact me at [email protected], call 941-216-5727 or visit LiveForChocolate.com.